"A real marriage isn't perfect. A real marriage is two people being perfected." The Perfection Infection happens when we cultivate unrealistic expectations of ourselves and our spouse, gradually leading to intimacy-killing behavior, also known as the "Seven Slow Fades." That was the case for Jill and Mark Savage, and In No More Perfect Marriages they guide you in everything you need to know to kick the Perfection Infection right out and return to intimacy. 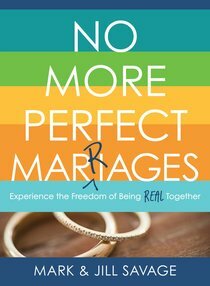 About "No More Perfect Marriages: Experience the Freedom of Being Real Together"
With five children of their own, Jill and Mark Savage are passionate about helping families. Jill is the founder and CEO of Hearts at Home, an organisation that encourages, educates and equips mothers, and the author of five books. Mark has served as a pastor for more than twenty years. They are now travelling, speaking, and writing together to bring hope to parents all over the world.